In the past, it was natural to have a hearty lunch in the dining car when travelling by train. 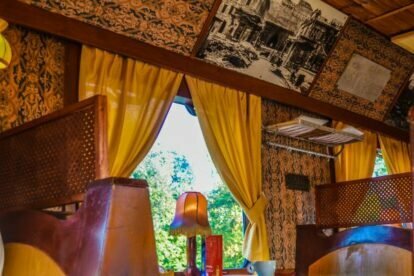 Today, there are only memories for ordinary travellers, but fortunately, next to the second busiest Budapest railway station (Déli pályaudvar/South Station), we can sit in a dining car for a bit of nostalgia. Here, you can have a nice lunch or supper in an old dining wagon. The food is not unforgettable, but not bad either. It’s about the feeling of the place anyway. It is narrow, small, a little lop-sided, but this was the wagon to eat. The kitchen is in there too. The inside of the wagon is full of old railroad relics; in the summer it’s also possible to sit in the garden place. Every weekday between 14:00 and 17:00 they have a 50% discount on all their meals! After a good meal, I can suggest walking in the big park named Vérmező (~Bloodfield). It was named after the execution of Ignác Martinovics and his peers there on May 20, 1795; at the end of the park at Széll Kálmán Square, they erected a memorial. The area was first landscaped around 1820. Later it was used as a military field. And now it’s a calm and peaceful park.